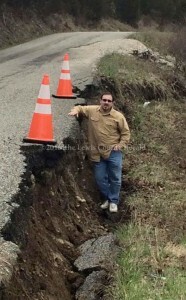 Clifford Hampton demonstrates the extent of a slip on Big Cabin Creek Road. Emergency funding has been applied for to make repairs. Ruckel said the slip is 8/10 of a mile from Ky. Rt. 57 and affects about 127 feet along the roadway. “We submitted a request for emergency funding to the Kentucky Department of Transportation on March 4,” Ruckel said. “They will send someone to review the request and look at the damage and then make a determination about funding it,” he said. Ruckel said the county can’t do anything at the site until they hear back from the state. “We have orange cones at the location and urge motorists to use caution when traveling in that area,” he said. Road Supervisor Bob Moore said he will be contacting the Kentucky Department of Transportation on Tuesday to try and get an update. “We are ready to begin emergency repairs as soon as we hear back from the state,” Moore said.